Lipivir Lip Ointment - 2g - $26.99 - the first non-prescription product to provide a daily preventative routine to reduce the frequency of cold sore outbreaks - it goes on clear, can be worn under your usual beauty products and will stay put under makeup and sweat. 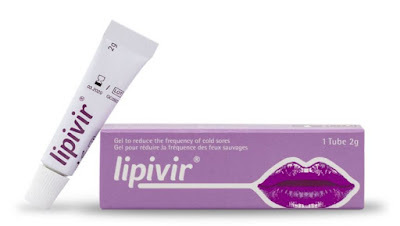 Made from a safe, drug-free formula of polyethylene glycols, it's a gentle gel which prevent the cold sore virus from infecting healthy lip cells to produce cold sores - just apply it twice a day to the outer edge of your lips - morning and night and it will dramatically reduce the frequency of cold sore outbreaks - because the tube is tiny, it's easy to take on the go so you never have to miss a treatment - one tube lasts about 2 months. I'm a cold sore sufferer so I was happy to see this show up in my mail box, it's hard to say if it's effective since you will only know it works when nothing happens - but I can say that it's very pleasant to use, unlike most of the cold sore treatments I deal with, this has no medicinal smell, it actually smells sweet and tastes like lemon! Visit lipivir.ca to purchase online and for retail availability.